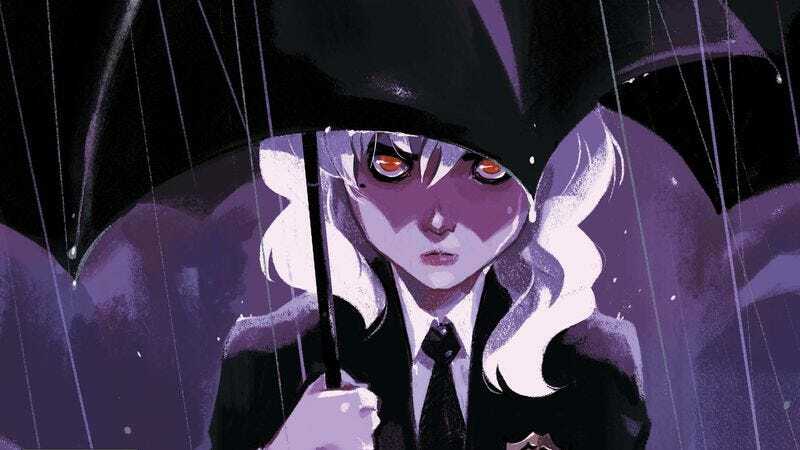 Gotham Academy is regularly one of DC Comics’ most fun, exciting releases, but next week’s issue sees a big tonal shift for a story about grief. Olive Silverlock’s mother has passed away, and Olive’s classmates want to comfort their friend but aren’t quite sure how. It’s a big departure from the lighthearted adventure that has defined past issues, but sadness is a part of the teenage experience, which makes it a valuable emotion to explore in a teen-centric comic. Writers Becky Cloonan and Brenden Fletcher understand that a lot of times these moments of sorrow are observed in silence, and this preview of Gotham Academy #8 is primarily concerned with creating solemn atmosphere. Artist Karl Kerschl emphasizes the quiet emptiness of the school while everyone’s at the funeral, and colorists Serge LaPointe and Michele Assarasakorn cover the book in shades of blue that make everything feel especially cold. Kerschl returns to art duties after taking a one-issue break (allowing Mingjue Helen Chen to jump on the title for last month’s gorgeous Damian Wayne-centric issue), and his atmospheric, expressive art brings immense emotion to just these four pages. If this preview is any indication, it’s going to be a heartbreaking issue, but this book could use a bit of darkness to create some contrast with its bright tone.